Summary General Ledger Balances Report: This report illustrates Treasury’s Loans Receivable, Capitalized Interest Receivable, Interest Receivable, Interest Revenue, Gain, and Loss balances associated with every corresponding borrowing agency’s expenditure Treasury Account Symbol. Detail Principal and Accrued Interest Balances Report: These reports illustrate Treasury’s Loans Receivable and Interest Receivable balances associated with each individual borrowing agency’s expenditure Treasury Account Symbol. 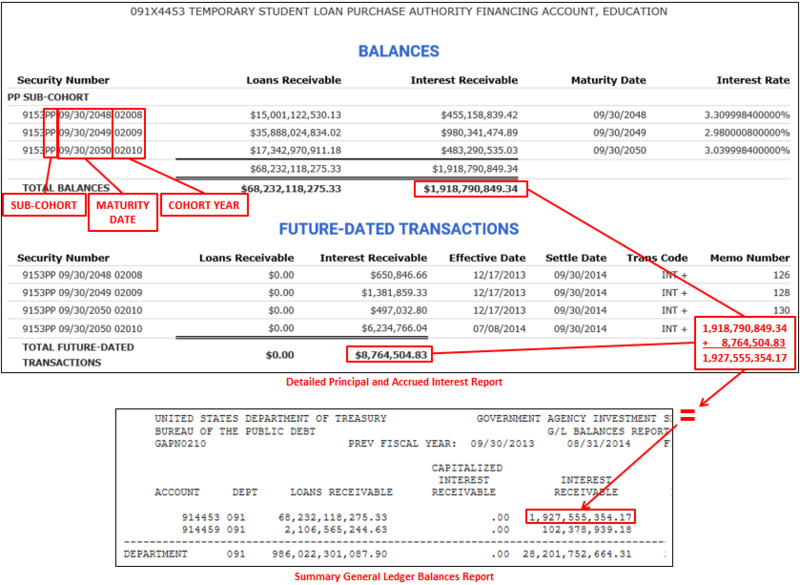 The top section shows the principal outstanding and the related accrued interest for each individual loan within the specified account portfolio. The bottom section of the report, labeled “Transactions,” shows other principal and accrued interest outstanding, such as the accrued interest on early repayments for credit reform programs, overdue principal on matured loans, and overdue interest. Adding the Shares/Par and Income totals from the top and bottom sections will equal the Loans Receivable and Interest Receivable totals on the Summary General Ledger Balances Report. Federal Credit Reform Funds: Treasury accrues interest daily based on the prior fiscal year's rate, unless an updated rate estimate is provided by the borrowing agency. The estimated rate is adjusted to the actual rate when it becomes available. When principal is repaid to Treasury between October 1 and August 31, Treasury will reverse accrued interest previously reported and accrue ½ year of interest on the principal repayment. Treasury will compound the ½ year of interest once the actual interest rate is received at the end of the fiscal year. When principal is repaid to Treasury between September 1 and September 30, Treasury will accrue a full year of interest.